Seniors who wish to participate in Senior March should complete this form and return it to Mrs. Dushek or Mrs. Starling by April 24th. Senior’s need to arrive by 6:15 to line up for the March which begins at 6:30. 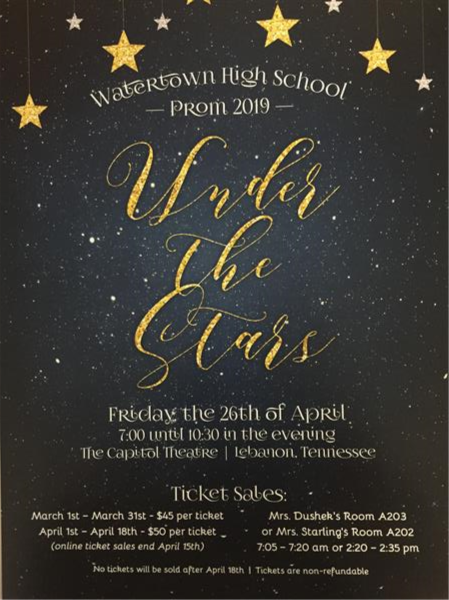 Juniors or Seniors who wish to bring a non-WHS student to Prom as a guest must submit this form with their guest’s acceptable identification to Mrs. Dushek or Mrs. Starling by April 22nd. Prom will be Friday, April 26 at The Capitol Theatre! Thursday, April 18th is the last day to purchase tickets at school. No tickets will be sold after Thursday! See Mrs. Dushek or Mrs. Starling before or after school to purchase tickets. May 8 – AP English Literature and Composition (AP English 4) – 8:00 A.M.
May 10 – AP US History – 8:00 A.M.
May 15 – AP English Language and Composition (AP English 3) – 8:00 A.M.